American bobtail cat is a much loved cat breed. As the name implies, this bobtail cat is a cat breed native to North America. There is speculation that the breed might be related to the short-tailed cats that lived on the islands that once belonged to Spain and Portugal. These cats would have entered America on the Spanish and Portugese ships during the age of exploration - they were useful animals to have on ships as they hunted the rodents that spoiled the food on the ships. 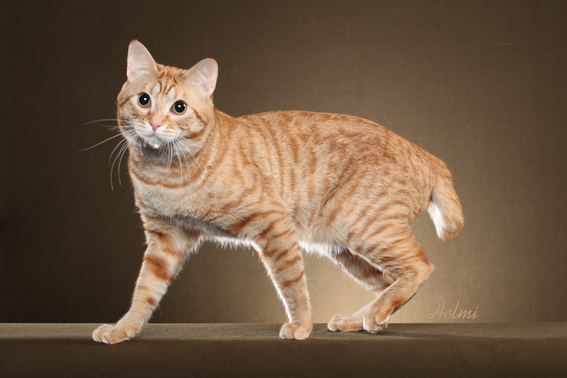 Helmi Flick's photograph of a short haired American Bobtail cat. Thank you, Helmi Flick, for letting me use your beautiful photo of MagicBob Yukon Red for this article. The breeding of the American Bobtail started in the late 60's. The first American Bobtail is considered to be a cat called Yodi. A couple, John and Brenda Sander were visiting an Indian reservation in Arizona. According to one story a child brought the cat as a kitten to their hotel. This brown tabby kitten made an impression on the Sanders couple, and they took him home when they left. A theory has been presented that Yodi would have been a hybrid between a bobcat and a domestic cat, but it such a cross breeding would have been possible, Yodi would most likely have been sterile. This, however, was not the case with Yodi; the Sanders had a seal point Siamese called Mishi, and Yodi fathered kittens with her. The kittens had Yodi's short tail which proved that the short tail gene was dominant. These bobtail kittens were outcrossed with longhair color points (Himalayan, Birman and Himalayan/Siamese crosses). Feral bobtail cats from USA and Canada were also used in the creation of the breed when the original breeding line of Yodi became too inbred. No Manx, Japanese Bobtail or pedigree cats were used and as a result this breed is today a healthy breed. To keep it healthy, outcrossing to domestic cats is still allowed. The intention of the breeding program was to create a sturdy, wild-looking cat with the temperament of a pet cat. The new breed was accepted in the new breed category of the International Cat Association in 1989, and gained full recognition in 2002. What is this breed like as a pet? The photograph of MagicBob Yukon Red is copyrighted by the professional cat photographer Helmi Flick. Do not use without permission from Helmi. You'll find her website here.